Depending on whom you follow determines the combination of cycles with which you are familiar. Maybe it is the Hurst cycles (developed by JM Hurst). Or, maybe you are a fan of Gann (cycles are generally based on 360 degrees in a circle). Or, possibly you follow Martin Armstrong (he identified the Pi cycle). David Knox Barker follows the Wall and Kitchin cycles (I like their application to swing trading). Then there are the cycle groups developed and followed by Bud Kress (I believe he passed away recently, but Clif Droke is a disciple you can follow). Today our long view will be developed using the Kress Cycles. The numeric time cycles which comprise the 120-year series include the 60-year, the 40-year, the 24-year, the 20-year and the 12-year. The 120-year is the primary composite cycle according to Kress. It includes three 40-year primary bias cycles and five 24-year primary direction cycles. 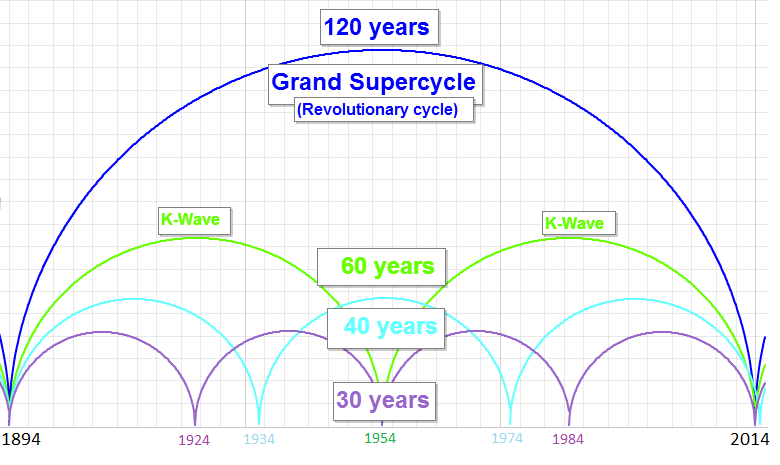 The 60-year secondary composite cycle (which is analogous to the "K Wave") includes three 20-year secondary bias and five 12-year secondary direction cycles. As Kress points out in his latest report, "Excluding both composite cycles, this leaves four cycles which determine the market directional behavior for the three designations of time – years, quarters and weeks." In total, there are twelve cycles comprising the Kress cycle methodology. The 120 year cycle prior bottoms were 1774 (Revolutionary War period), 1894 (beginning of the industrial economy) and 2014 (expected bottom - beginning of a new social order - socialism). So the 120 year Grand Super Cycle is often referred to as the revolutionary cycle (political revolution - 1774, economic revolutionary - 1894, social revolutionary - 2014). The secondary composite cycle is the 60 year K wave cycle (last bottom 1954 (which was the top of the 120 year revolutionary cycle). All these cycles should bottom in late 2014 (now that should be a bottom to write home about). Next (part 2) comes the less long cycles (24, 20, 12, and 10 years). The 24 year cycle peaked latter part of 2002, the 20 year cycle in 2004, the 12 year cycle in 2008, the 10 year cycle in late 2009. She should see that chart! thank you, Inlet. We will bounce significantly higher into month's end, starting Tuesday. Appreciate your willingness to share your knowledge.